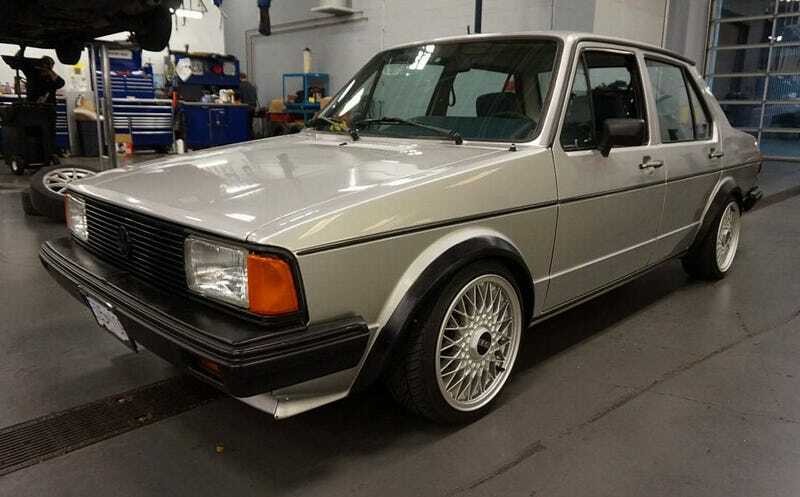 For $5,200, Could This Rare 1984 VW Jetta GLI Wet Your Whistle? Volkswagen was just a little more than a decade into water-cooling when today’s Nice Price or Crack Pipe GLI was built. Could this classic sporty sedan be currently priced to make someone take the plunge? Family-friendly films almost always have happy endings. I mean, nobody wants to go home with crying kids, right? With its $2,450 price tag, yesterday’s family-friendly 1997 Ford Aerostar AWD also came out on a happy note, earning a laudable 74-percent Nice Price win before the credits rolled. No, it might not have been what you would drive, but that didn’t stop the majority from finding in its favor. You know what we Americans favor? That’s right, it’s sedans over hatchbacks. Yes, we (I’m making figurative pointing motions back and forth between us) like hatches just fine, but the general populous has long preferred cars with boots over those with tailgates. That’s what led Volkswagen to booty-fy its vanguard in the transition from air-cooled to water-cooled models, the hatchback Golf. The result of course was the Jetta, and while the Golf had been a solid seller for VW here, but the Jetta became North America’s top selling European import. Mic... drop. Part of the reason for that first Jetta’s success was how well the new boot was integrated into the existing Golf styling. That was likely owed to it being the work of ItalDesign, Giorgetto Giugiaro’s non-ironically named Italian design house. ItalDesign had handled the original Golf’s looks, so it was a no-brainer to have them Kim Kardashian it as a follow up. Along with sharing a lot of Golf bits, the Jetta also matched its hatchback sibling with the availability of a sporty model. The GLI was little more than a rabid Rabbit GTI with a 13 cubic-foot bin stuck on the back. Here we have a 1984 Volkswagen Jetta GLI that’s seemingly been attended to in loving fashion. I mean this car presents really well. As I noted, the GLI is closely related to the Golf (Rabbit) GTI, and shares that car’s 90-horsepower 1.8 four, and its close-ratio five speed transmission. The ad notes an additional change for the GLI over the standard Jetta, that being a winglet mounted on the driver’s side windshield wiper for Autobahn speed wiping performance. This one happens to be a Canadian car, but is apparently offered here in Portland Oregon, and in American dollars. It presents applaudably in its Diamond Silver paint and benefits from both its Euro nose and tasty BBS RZ baskets. The ad says it rolls on Federal Formoza tires, but I have no idea what the hell those are. All I do know is that this car could stand some rubber that fits. Behind the spaced wheels is a coilover suspension with a good bit of Neuspeed to its name. A rebuilt steering rack and poly bushings mean this car should ride and turn as tight as a seat on a Spirit 737. A newish clutch and re-bushed shifter should make for good rowing as well. A pop under the hood reveals a couple of things of note. First off, man there’s a lot of room in there! Next up, that 1.8-litre looks pretty clean, and in fact the head has been worked over. There’s also new timing gear, and a 90 amp alternator out of a MK3 to light up your life. Inside things look equally tidy. The blue interior is in great shape with no appreciable degradation of the dash or door cards evident. The seats look great and this generation of Volkswagen has those wonderful little Christmas tree LEDs in the dash which are a fun throw-back. An aftermarket Momo tiller looks like something you might want to get handsy with as well. The seller provides a number of up the skirt pictures in his ad, and they shows both a new exhaust system—although its it sans-cat?—and no evidence of rust or accident damage. The car comes with a clean title and a number of additional parts and papers that come along for the ride. All in all, the 131,000 mile car (yes, the odo reads 212K, that’s kilometers) looks to be well kitted and seemingly sorted. The question for you is: could it be worth its $5,200 asking? What do you think, is this MK1 Jetta worth that kind of scratch? Or, is this a “Golf with a trunk” with a price that makes you want to give it the boot? For $2,450, Could This 1997 Ford Aerostar AWD Let You See The Aero Of Your Ways?